Ports - Projects | Allen & Graham, Inc. Installation of 14 crane tie-downs used to anchor ship-to-shore cranes that load/unload ship’s cargo. The Tie-downs are used to anchor the cranes during a hurricane. 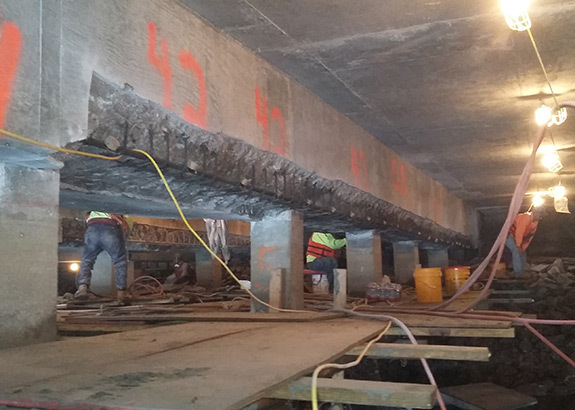 Project consisted of strengthening of existing concrete with carbon fiber fabric, replacing the fender system, mooring hardware, fire protection, and electrical system along 3000 LF of berth frontage. Designed and constructed warehouses with material handling systems for storing and handling bulk fertilizer. Warehouses constructed entirely out of wood and concrete due to the highly corrosive contents and environment. 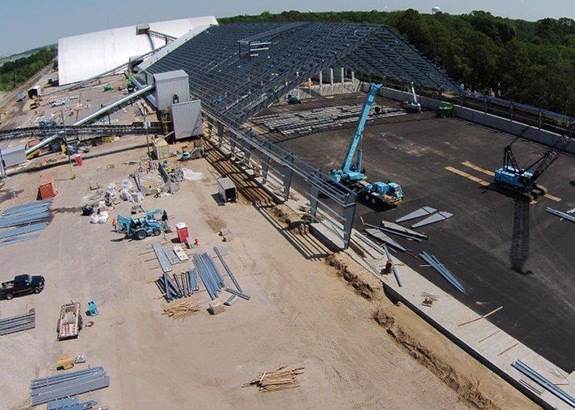 Included 600’ conveyor system with two towers, 25,000sf building, and associated underground pipe work with site work. 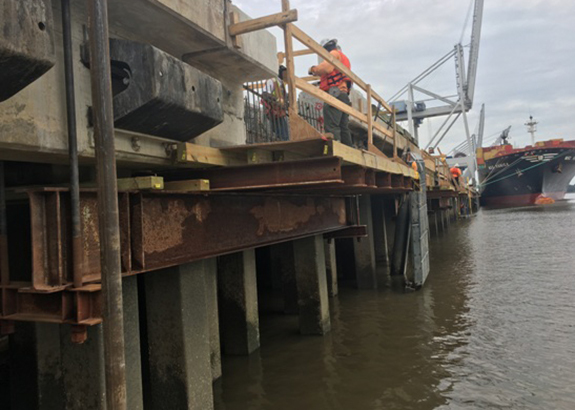 Refurbished and restored dock including concrete restoration and reconstruction, as well as, wood piling and timber fender system, including FRP pile jackets. A&G worked off floats and scaffolds, and around tide changes to complete this project. 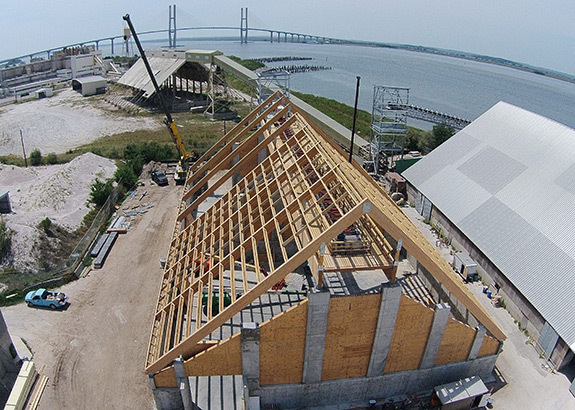 In July of 2015 a fire devastated two bulk storage warehouses containing wood pellets at a port in Brunswick, GA. The disaster created the immediate need for a replacement facility. Every day without sufficient storage capacity was costing the client significant lost revenue, so the completion timeline was crucial. Logistec Corp. awarded the design-build contract for the #4 Terminal Bulk Shed Project to Allen & Graham. To meet the client’s demands, the design and construction of a new 80-foot tall, 140,000 square foot warehouse were performed simultaneously. The project included a metal building, concrete containment walls, complex conveyor systems, a dust collection system, and various fire prevention systems. During the project over 100,000 MHS were worked with no accidents. The warehouse stored 50,000 tons of wood pellets which were loaded onto ships and transported to European countries to be used as fuel for the generation of power. The entire project was designed and constructed in 8 months. This project was awarded the 2016 AGC Build Georgia Award. Click here to watch the timelapse video of construction.